"This cheesy, creamy, rich crawfish pasta is found at every family gathering in the New Orleans area - a great addition to your seafood recipe box and a great way to try crawfish!" Bring a large pot of lightly-salted water to a rolling boil; stir in the egg noodles and return to a boil. Cook the pasta uncovered, stirring occasionally, until the pasta has cooked through but is still firm to the bite, about 5 minutes. Drain well in a colander set in the sink. Meanwhile, melt the butter in a large skillet over medium heat. Stir in the chopped onion, green pepper, garlic, and parsley. Cook and stir until the onion has softened and turned translucent, about 5 minutes. Add the crawfish tails and Cajun seasoning; simmer 5 minutes longer. Pour in the heavy cream, mushrooms, and 1/2 cup of Cheddar cheese; stir until the cheese has melted. 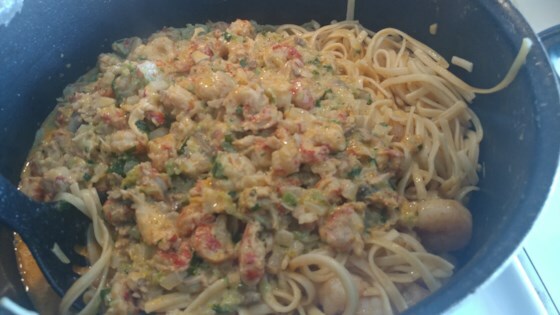 Toss the pasta with the crawfish sauce and green onions; sprinkle with the remaining Cheddar cheese. This recipe was quite good but the cheese sauce overwhelms the crawfish. After tasting , I added some imitation crabmeat, 1/2 cup or so. The crab brought out a more pronounced flavor.